At some point or another, you’ve probably found yourself carefully scrutinizing a food item to find out whether it’s gone bad. 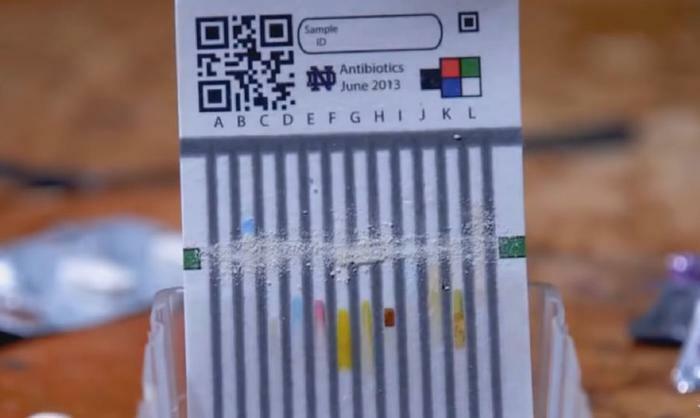 But the days of banking on visual examinations, sniff tests, and unreliable expiration dates may soon be coming to an end, thanks to technology. At the 254th National Meeting & Exposition of the American Chemical Society (ACS), researchers presented their work on a paper sensor that can detect when food or cosmetics are spoiled or contaminated. Unlike similar sensors that migrate on channels, the smart labels use “stable, inorganic particles that are redox active,” says Andreescu. “When they interact with the substances we want to detect, they change color, and the intensity of the change tells us how concentrated the analyte (the substance being measured) is,” she said. Because the paper contains all the reagents needed for it to work, the labels are extremely easy to use. Simply add the sample being tested to the piece of paper and watch for a color change. Once development is completed, Andreescu and her colleagues believe sensors like these could be incorporated into labels on food and cosmetic products to allow consumers to see when they should throw a product out. The sensors could also potentially be used to authenticate teas and wines by their antioxidant content, search for new medicinal herbs in the Amazon, or detect salmonella and E.coli to prevent food poisoning, the researchers say.